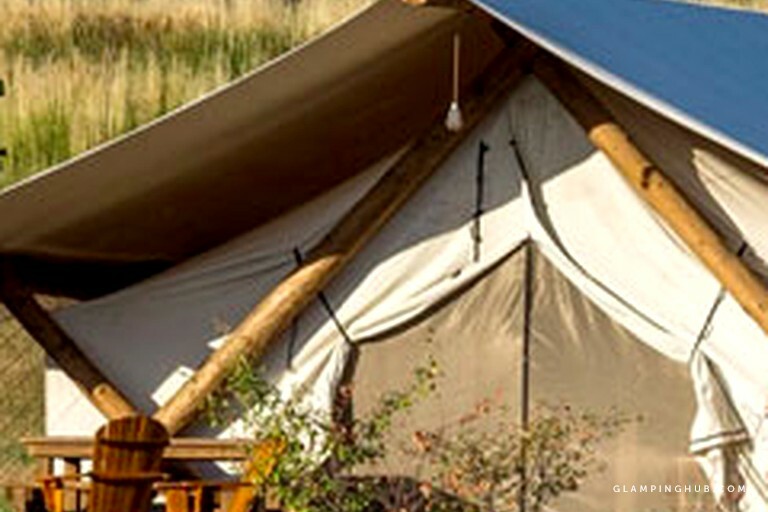 An incredible escape for both couples and families, these luxurious safari tent rentals on picturesque Bear Lake, Utah, are a nature lover's dream. Inside, guests will have electricity, a full bathroom with a shower, a heater, and elegant furnishing. 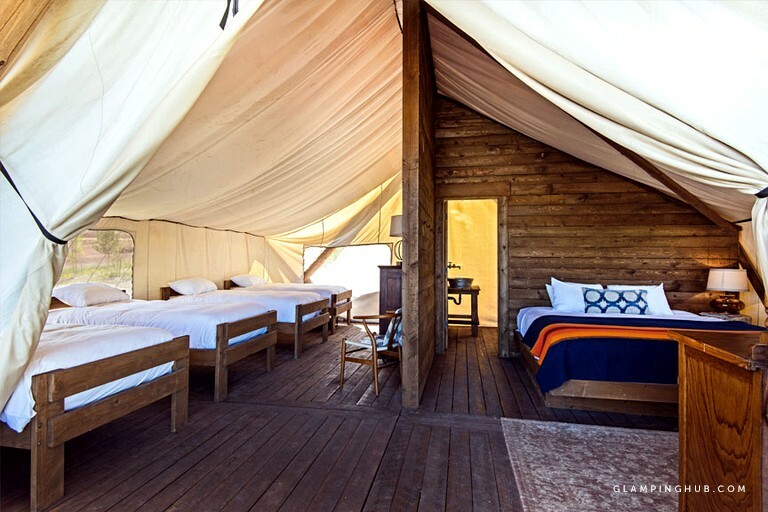 Guests will have access to a private campfire, a mini-fridge, and a safe for valuables during their outdoor getaway. This old-west influenced ranch offers top-notch cuisine on-site. The campsite's grill serves up delicious pizzas baked in a wood-burning brick oven, quality grilled steaks and fresh salads. Step up and grab a pizza to-go, or opt for table service and enjoy a table under the covered pavilion with the whole family. Guest will also have a plethora of high-quality wine and craft beers to choose from. A barbecue area is also provided for guests convenience so that they are able to enjoy an outdoor cooking experience. 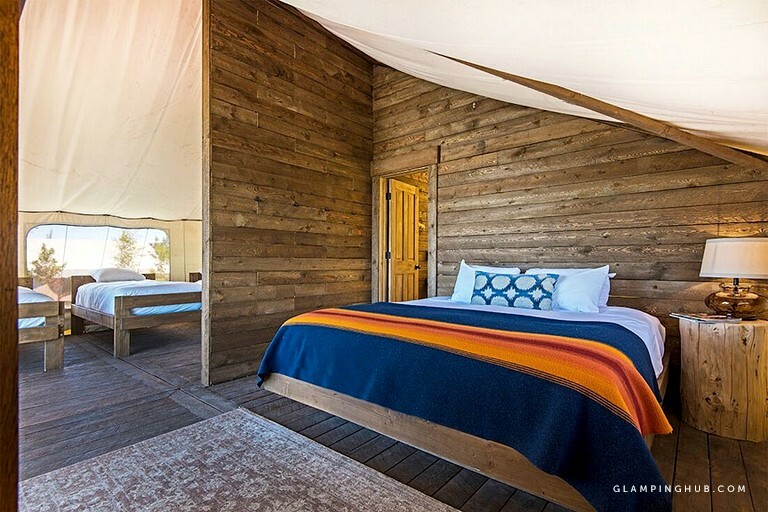 A luxury camping ranch wouldn't be complete without spa-style bathroom amenities, and that's exactly what glampers will find here. From state-of-the-art showers equipped with waterfall shower heads to slate floors and barn-wood finishes, these campground facilities with have guests relaxed and ready for the day to come. 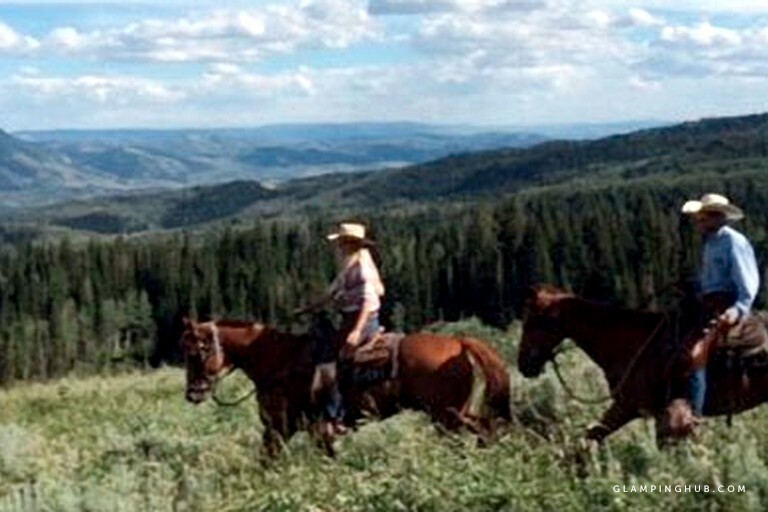 If guests are seeking outdoor fun, as well as a western experience of a lifetime, this is the place for them. Families will find plenty of ways to keep the kids entertained. An activity field is available for any and all outdoor sports. Guests will be able to play with frisbees, soccer balls, footballs, and lawn games. In addition to the great outdoors, kids can enjoy some time in the game tent, equipped with a ping pong table and video games. The annual raspberry festival is a local favorite and a delight for guests of all ages. Know as "Raspberry Days" thousands of people flock to Bear Lake every August and attend the Raspberry Days Festival to relish the area’s famous raspberry shakes. Glampers will enjoy cold, creamy raspberry shakes all summer long. 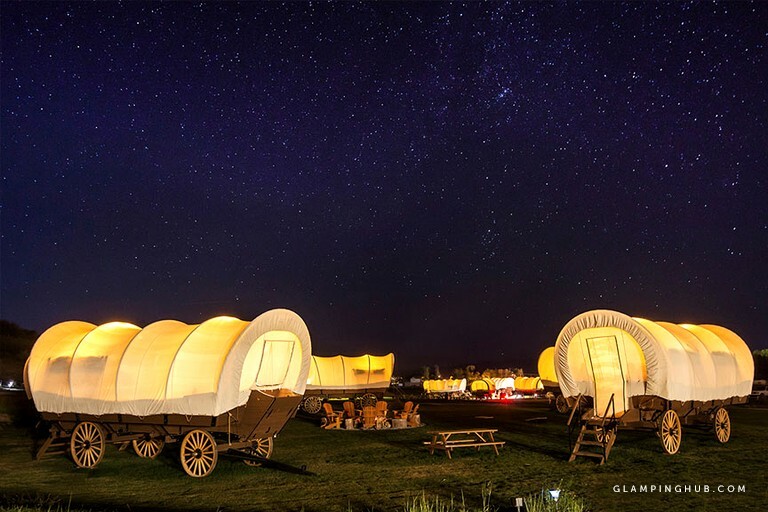 This site also offers live entertainment—from musical shows to cowboy poets—every Saturday night. This property is seasonal and open May 18 to September 30, 2018. 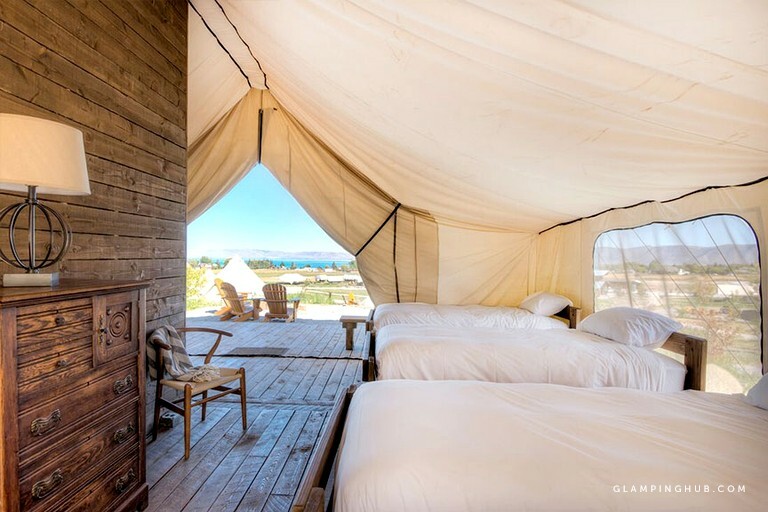 There is no minimum night stay for the glamping tents. For the ultimate relaxation for all guests, radios, music or any sounds transmitted via speakers are not permitted. Quiet hours are enforced between the hours of 10 p.m. to 7 a.m. daily. Trash receptacles are located throughout the property and should be utilized frequently to discourage unwanted visitors of wildlife and insects. Keeping tent and wagon doors closed at all times will further reduce such visitors. Fire service and firewood are provided. Firewood from outside sources is not permitted.